Take A Kid Mountain Biking Day - Saturday October 4. 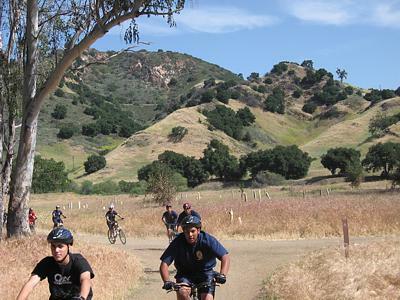 In conjunction with the IMBA Take a Kid Mountain Biking Day event, CORBA will be having a fun ride at Malibu Creek State Park at 9:00 am. The ride will be followed by a barbecue. Kids must have their own bikes and helmets. All ages are welcome! If your Kids are too young to ride, feel free to bring a bike trailer or trail-a-bike and tow them along. These can be your own kids, nieces, nephews, friends kids, neighbor's kids... There will be a few different ride options for different age groups. Feel free to participate even if you don't have any kids to bring. Childhood obesity in the United States has reached an all-time high. Experts say that the current generation of U.S. children could actually have a shorter life expectancy than their parents. IMBA and CORBA believe mountain biking can help reverse this trend. We need your help to get kids back on bikes. Please RSVP to Hans at hans@corbamtb.com if you plan on attending. Save the date! The 2008 Fat Tire Fest will be held on October 12, 2008 at Castaic Lake. Registration is now open for this year's event. Remember, CORBA members get a discount when registering! Register early to receive free raffle tickets. 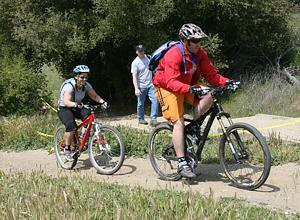 Come to the Southern California mountain biking event of the season, the 2008 CORBA Fat Tire Fest! It's fun for the whole family and you'll be helping support our ongoing mountain biking advocacy and recreation programs. This year's event has even more than last year! Never been to a Fat Tire Fest? Check out the photos and video from last year! See you at Castaic Lake Oct 12th!! The fire department has come through and graded some areas for fire clearance. In the process some of the trails have been damaged. We will make some minor repairs on those areas as well as doing some brush removal on some of the overgrown trails. We want the trails looking good for CORBA's upcoming Fat Tire Fest on 10/12! Bring your Mountain Bike if you would like to ride into the area where we will be doing the trail maintenance and maybe do a ride after trail maintenance too! If you do not want to ride in we should be able to drive in relatively close to the area and then hike in a short distance. We will meet at the Superintendent's office. Details on CORBA's Calendar. Join CORBA, Santa Monica Mountains Trail Council, Conejo Open Space Conservation Authority and other volunteers groups to work on the Conejo Open Space trails. There will be a thank you Bar-B-Que after the work. This is a great event with many volunteers. Get further details from the Conejo Open Space Foundation Trail Work Page and photos from previous COSCA trailwork events. Sunday September 21 - "The Oldest Ride in Palos Verdes"
Sunday October 5 - Gabrielino, Kenyon Devore, Rincon Redbox. Pasadena Area. Sunday October 19 - Chino Hills. Saturday, October 25 - Lower Merrill to Inspiration Point and Sunset. Pasadena Area. Saturday October 4 is the next skills clinic. 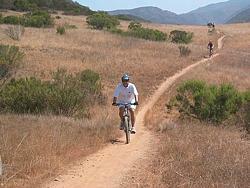 Do you have any ideas about mountain biking recreation in the L.A. area? Would you like to apply your skills and manage projects that contribute to the sport and lifestyle that you love? Is there an advocate in you? We are recruiting motivated individuals who work well with others. Send an email to info@corbamtb.com, come to a board meeting, or speak to a Board Member at the Fat Tire Fest. 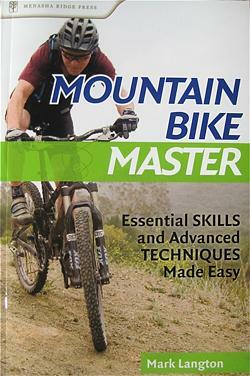 Mark Langton, CORBA’s Introduction to Mountain Bike Skills Class coordinator and instructor, has published his second skills book, “Mountain Bike Master.” Says Langton, “The title was the publisher’s idea. I wanted it to be “Mark Langton IS a Mountain Bike Golden God!” The book is a compilation of knowledge from over 20 years as a mountain bike journalist and instructor and contains easily understood descriptions and lots of photos of all the core trail riding fundamentals—from basic to advanced—that every mountain biker should know. The book will be distributed nationally through bike shops and at www.menasharidgepress.com, or you can order a signed copy directly from Mark. Contact him at 805-558-1606 or markmtb@roadrunner.com. For info on Mark’s personal coaching go to www.mountainbikeskills.com. Bring your special events planning experience to an industry leader! As an Outreach Specialist in the Northridge store, you will work closely with your store management teams and community partners to plan and promote in-store and community clinics, corporate promotions and other events. This position does require some evening and weekend shifts. This position is part-time only but possibly full-time if combined with a floor sales position (benefits may be available if full-time). The job posting will be open until 9-30-08.